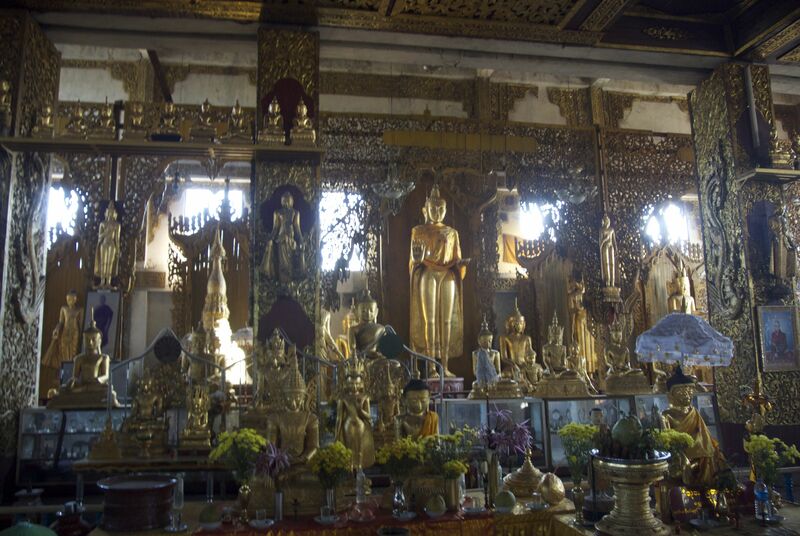 We waltzed right into this empty monastery full of golden Buddha statues. My hotel in Mawlamyine arranges for my overnight bus to Yangon (Rangoon). It’s as easy as a phone call and a motorbike ride to the bus station: which is really just a dirt lot with some buses parked in front of a shop. While I wait I’m asked for my ticket several times and am eventually led to a seat in the front of a full bus. It is new, and a screen in the front is showing music videos. I situate myself with my neck pillow and blanket. Even though the bus is nice and the price seems fairly reasonable considering, I will eventually learn in Myanmar that foreigners get charged significantly more. Like hotels, the government requires companies catering to tourists to have a permit, and to charge them more than locals. I get a bit of rest and then go to see some of Yangon’s sites. I ride the “circle line,” which is what it sounds like. It takes about three hours and it goes, at times very slowly, through and around Yangon’s outskirts. It’s interesting to look out the window, bounce along with the train, and see how fast it can turn from urban to rural in Myanmar’s biggest city. That night I walk west from my hostel near the train station. I walk through Little India, past Sule Pagoda, eating street food as I go. By the time I get to the bustle of 19th Street and Chinatown, I’m not at all hungry. Famous barbeque restaurants line the street, the major roads perpendicular host to a night market of produce and goods. Here, one can get both a pretty picture and the cruel reality of life in Yangon. There is great food, an exciting atmosphere, some of the holiest sites in the country, but also streets filled with garbage, stray animals, and often the smell of sewage. It’s a mixed bag, really. In the mornings, watching the monks walk the streets barefoot collecting their alms is a bit arresting. I hop the train for the two-hour ride to Bago, a holy city of pagodas, monasteries, and busloads of devout Thai tourists. Trains (actually infrastructure in general) in Myanmar are not exactly kept up. They function like you would imagine trains did in the 19th century. In the two hours, I lose contact with my seat several times and am amused by the far from subtle rocking back and forth of cars. This will be one of the reasons why I avoid taking any sleeper trains during my stay here. 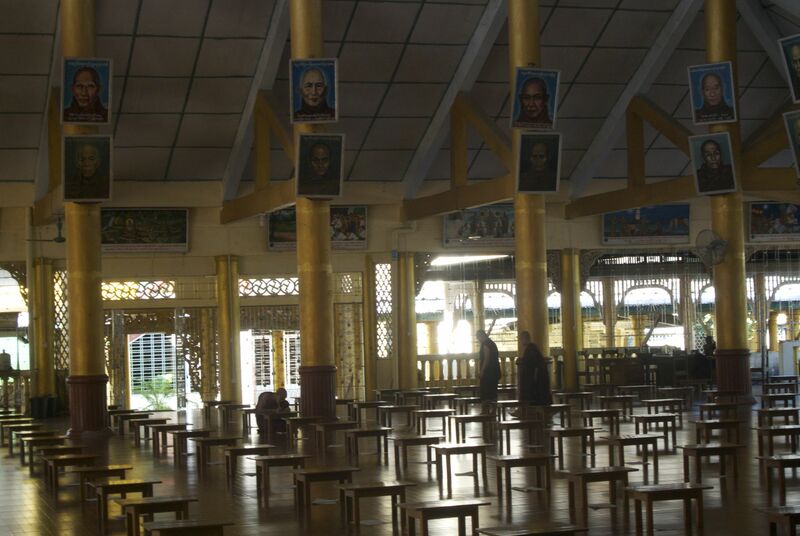 A lone novice monk finishes his exam. I’m approached at the train station by a well-spoken teenager (this is a trend, maybe). He helps me buy a return ticket back to Yangon later that afternoon and offers his services for my day in Bago. The price is right and five minutes later I’m getting onto the back of a motorbike with his father. We go around to all the sites, some of which I would have never visited on my own, being led by this small old man into parts of monasteries that I wouldn’t have just casually walked into. We go to a very famous monastery that has a statue of Aung San (the father of an independent Burma who was assassinated, along with his cabinet, in 1947; also, the father of Aung San Suu Kyi, the Nobel Prize winning leader of the National League for Democracy, who has spent the last 20 years in and out of house arrest). Joined by a hoard of wealthy Thai tourists, we watch the monks file down the path with their alms bowls on the way to their one meal of the day. The tourists pack their bowls with snacks, rice, and crisp bills of Burmese Kyats. We go to yet more temples and monasteries, and then stop for lunch. The food in Myanmar, I’ve found so far to be delicious and very vegetarian friendly. You just have to say the word (which sounds something like: Thet-Thah-Loohk) and you are greeted with bowls of delicious sides to go with your rice and soup. After lunch we go to a temple that my guide says is really relaxing. He tells me to lie on the ground, which he does too, and I suspect he wants to take a short nap. I lie there, starting to think that although my meal was delicious, the food I just ate is not going to be kind to me. I’m a bit dehydrated, templed out for the day, and increasingly not feeling well, so I ask to be dropped at the train station for my trip back to Yangon. On the train ride back, I’m reminded of another one of my rules of travel: Always come prepared with rehydration salts, the proper medications, and the foresight to realize that you will look back on this fondly while you are vomiting out the window of a moving train. This entry was posted on January 3, 2015 by alexjparton. It was filed under Asia, Myanmar, Travel and was tagged with Alms, asia, Bago, Buddhism, Burma, chinatown, Monasteries, monks, Myanmar, Myanmar food, Pagodas, Rangoon, Ride Trains, tourism, Trains, travel, vegetarian, Yangon.